The Palestinian Authority blames Israel for unrest in Jerusalem, accuses it of "provocation and incitement". The Palestinian Authority (PA) on Wednesday asked the UN Security Council to condemn Israel for its “provocation” in Jerusalem, AFP reports. According to the report, the PA’s envoy to the UN Riyad Mansour called on the Security Council to "adopt a position to call on the Israeli government to stop all these activities and policies of provocation and incitement." Mansour’s demand came following clashes at the Temple Mount on Wednesday morning, in which Israeli police came under assault by rock-throwing Arab protesters. Later on Wednesday, a terrorist plowed his car into two groups of pedestrians near the Jerusalem Light Rail, killing a Border Police officer before getting out of the vehicle and attacking passers-by with an iron bar. Mansour blamed the confrontation at the Al-Aqsa mosque on "extremists" who entered the mosque, some without taking their shoes off, which he said "is extremely provocative," according to AFP. "They are trying to push the region into religious confrontation," Mansour told reporters after meeting with Australian Ambassador Gary Quinlan, whose country chairs the Security Council this month. Jordan earlier recalled its ambassador from Israel and the foreign minister called on Israel to "respect the sanctity of the holy sites" following the clashes at Al-Aqsa. Quinlan said there was no request for an emergency council meeting but that there were discussions on the mounting tensions in eastern Jerusalem. Israel's UN Ambassador Ron Prosor sent a letter to the council accusing the Palestinians of incitement and noting that there had been no UN condemnation of attacks on Israelis. 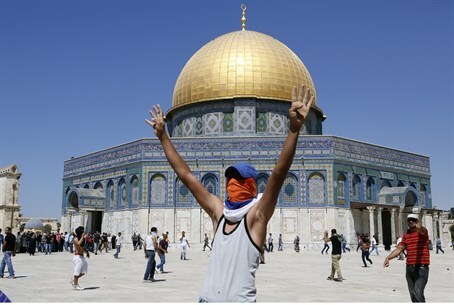 Arab rioting has become a norm on the Temple Mount, which is under the jurisdiction of the Jordanian Waqf. The Waqf heavily restricts access to Jews in addition to banning all Jewish worship on the Mount.